Introducing the Microsoft LifeCam VX-5000 – Featuring Windows Live compatibility, World Class VGA Optics, superior low-light performance and a fun flexible design. Share more experiences with family and friends. 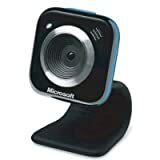 Optimized for Windows Live and Windows 7, the LifeCam Cinema also works with Yahoo Messenger, AOL Instant Messenger and Skype for video calls and messaging.